The overall number of participants in high school sports increased for the 29th consecutive year in 2017-18, according to the annual High School Athletics Participation Survey conducted by the National Federation of State High School Associations (NFHS). This steady increase in the number of girls participating in high school sports reached an all-time high of 3,415,306, and boys participation also set a new standard at 4,565,580. UHC’s orthopaedic specialists work well with patients in the community because they’re a part of the community. They understand the importance of being there for these young patients when it’s convenient – even if that means after the big game. 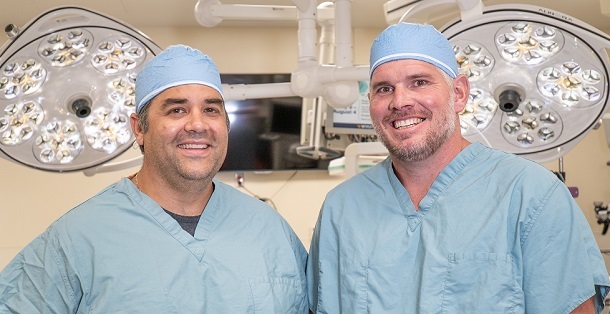 Dr. Courtney and Dr. Fazalare, function as medical professionals for four college football teams–Glenville State College, Fairmont State University, Salem University, and Alderson Broaddus College. Dr. Courtney can also be seen frequently on the sidelines at Bridgeport High School football games. So where did the idea stem from? “My partner Dr. Courtney had the idea earlier in the year. He called me late one night and asked me what I thought and I loved the idea,” said Fazalare. “From our perspective, access is big. Fazalare said during many of the college football games attended by himself and Courtney they see others for evaluation. He said it usually takes place in training rooms at halftime of the contests. The United Orthopaedic and Spine Center also offers Saturday and evening hours, along with the new hours from 9 p.m. to 11 p.m. on Friday. For information, contact United Orthopaedic and Spine Center, located at 227 Medical Park Drive, Bridgeport, WV, by calling (681) 342-3500. Editor's Note: Photo above shows Dr. Joseph Fazalare, left, and Dr. Chris Courtney. Photo courtesy of United Hospital Center.